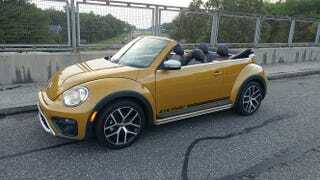 So I’ve got this Dune edition Beetle for a week. Fun car if just for the nostalgia factor (let’s face it, 170hp is not gonna tickle anyone’s pickle here..) but that color’s gotta go. Sandstorm Yellow looks okay in direct sunlight, but on cloudy days reminds me of what I used to clean out of my kids’ diapers. Oh yeah, it’s only available with the 6-speed autobox.